The double tower project sits within the Breathing Aggregations research, and investigates new forms of passive ventilation within large structures. The volumetry is inherited from the urban algorithm. Within this, custom-tailored agents generate a distributed ventilation network. The agents travel from bottom to top throughout the structure, finding the centre point at each level, and ensuring minimal distance between each of them. Their trails are then turned into venting shafts through manual remodelling. The plan is then organised around these shafts, forming the centre of cave-like communal space. 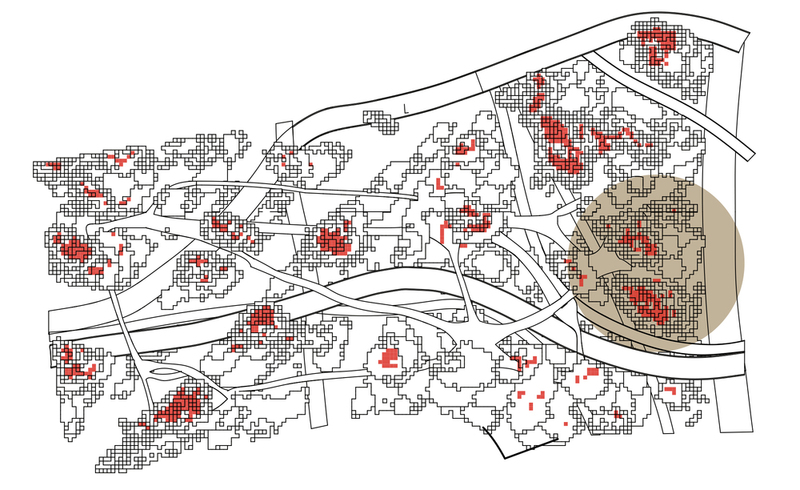 Other architectural properties (such as facade albedo, room orientation, programmatic distribution) all further add to counter-acting the urban heat island phenomenon.